We prefer to use a vacuum cleaner that uses a roller beater bar. Vacuum with the grain – or nap – of the rug. The roller bar should spin against the nap of the pile, which lifts the pile and enables the suction to pull out more dirt and debris. If you vacuum against the grain, the roller bar is essentially beating the nap down and not aiding in the proper cleaning of the rug. Make sure the vacuum cleaner is adjusted in such a way that the rug is not getting sucked into the machine. Listen to your cleaner: if the roller sounds like it is struggling to spin, then it is probably set too low; if there appears to be no resistance against the roller bar, then it is probably set too high. The roller should make full contact with the rug pile, but to a point where it still spins freely. Don’t stay on one spot for too long. 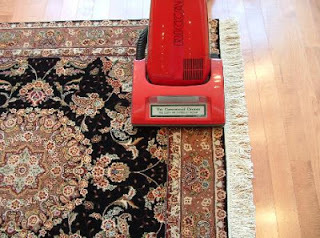 Vacuum the rug vertically in a fluid back and forth motion. Avoid the corners and fringes. One of the most common repair cases that we see is fringes that are damaged by incorrect vacuuming. It is best to avoid vacuuming the fringes – especially longer ones - but if you have to, always go backwards over them, or pull the vacuum off the fringes in a backward motion, or use the nozzle. You don’t want the fringes to get caught in the roller. If that happens, turn off the vacuum cleaner immediately and manually roll the bar the opposite way until the fringes release. As always, please do not hesitate to contact us if you have any questions. My rug was in a flood! Now what? Rug Imperfections – Your Rug Is Not Defective! We’ve been selected as “Best of The Bay 2015″!